Kids had 2 days school break for the first two days of the fasting month. My kids' school didn't have any break for the beginning of the fasting month before. This year is the first time they have it. Before I forgot, to all my Moslem blogger friends / readers, I would like to say Happy Ramadhan! Hope your fasting will go smoothly during this fasting month. May God bless all of you! lina_to_u said : Thanks a lot Lina! so cute. Lia, you seem never lack of idea. Winsome little elves are perfect with party hats. 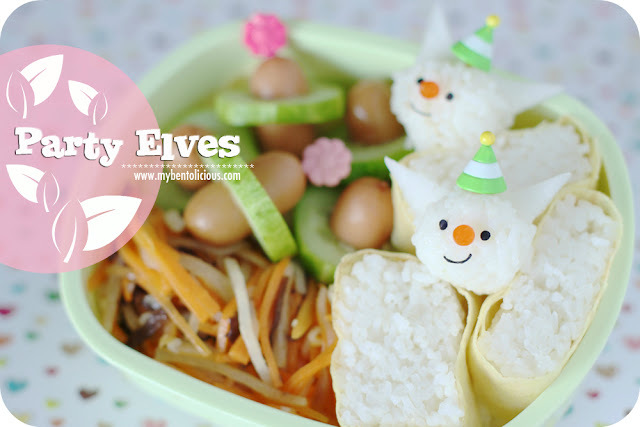 Loving your deft and sweet bento style, Lia!